Rift's "Double Crossers" is excellent work by all. Duluth looks amazing at night. Watch it all day. Joe Hall SOTY? “Real talk, it was the one for him, and a moment in time,” said Jurg Jourgensonn, better known by his rap name Rich Rich. That sublime feeling is skateboard fiction. I got the dreaded Laramie. 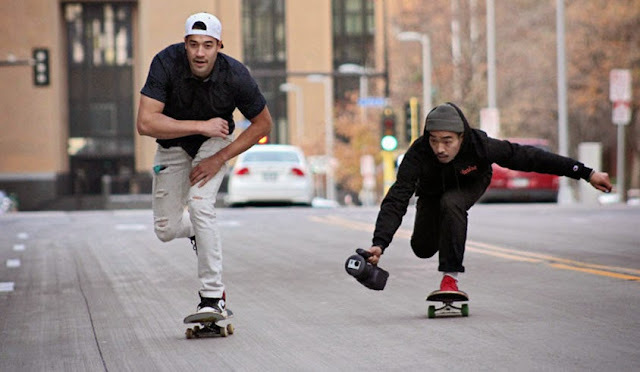 For a long, long time, Benji Meyer wanted to make a concrete cast of Sony's famous and skater preferred VX-1000--a camera first released roughly 19-years-ago--with the ostensible purpose of showing up at a spot and doing some reps with the likely heavy concrete replica. One must admit the handle on the iconic camcorder makes it ideal for some curls. That was a long time ago, back in heady days when we were roommates. This year, plastic variants of the idea above started showing up, with, instead of lots of mass, a slot on the death lens tip where a Go-Pro camera can be placed. The fabrication of the thing bore out proof that Meyer had teamed up with Anthony Hart and was about to make something happen, with more clues hidden in Meyer's most recent Instagram username switch. Now there's a website and the two are selling the things. Or less weird, with the commenting class pretty much feeling it. Will be monitoring the Slap board for the likely thread to follow. Might even do some legwork later on to see if those guys are selling anything. Waiting on responses regarding the availability of Get Born, per the last post's comments, but it's sounding like it will be posted online in the near future, perhaps via a mag site. Oh snap. There's a new Familia website. As they line up events seemingly every weekend this month (I never posted about the Chocolate event), there's another one this Saturday, with Big Joe Red. Peep their photo feed for details. My Spanish skills have slipped, per Google: "Support for gopro as the VX1000 is the biggest nonsense ever seen." Ha. Get your local-ish video fill this Sunday with Send Help's initial offering called Get Born. For those who need it spelled out, this means first Nesser part in a little bit and potentially a Tabari "Marcus" Cook part as well. Other potential fascinations include Brain Heck's already hyped section filmed out on the wild Bakken formation and what former man-am Randall Ploesser has going on roughly 700 miles down the Mississippi in St. Louis. The blog has suffered, I know, in part because I've gotten the opportunity to write some stuff for the newly renovated Ride Channel site. Thus far, it's been fun, because I've written some blog-like entries and discussed massive skateboard industry conspiracies with former pros on Facebook. Elsewhere, Chromeball interviewed one-time Minneapolis loc/infamous former pro Ryan Fabry. As illustrated by Fabry, our area's potential for forcing dudes to skate both street and transition goes back more than 25 years. For what the interview lacks in specifics about those bygone years around here, it's still a cool read. If one Fabry story/myth that I've heard from primary sources stands out, it's the persistent story of him feeble grinding the MCTC large rails at some point in the late-80s. That's heavy. Update: At the end, Daniel Castillo speaks the truth.